We all know the routine: Brush and floss at least twice a day to keep your teeth and gums healthy. By doing this, you can avoid cavities that require extra trips to the dentist and that annoying and uncomfortable drilling to repair. Brushing and flossing are good for your gums, too, and having healthy gums can help you avoid a slew of other problems. That’s because periodontal disease, or gum disease, has been shown in research study after research study to affect the body systemically, beyond the mouth into other areas such as the heart, lungs and blood. It has been linked to an increased risk of a number of heath conditions. Gum disease has different forms. The mildest is gingivitis, which is generally associated with poor oral health habits. With this form, you might notice your gums becoming red and swollen, and they may bleed easily. Gingivitis can be reversed with professional treatment and better oral hygiene. 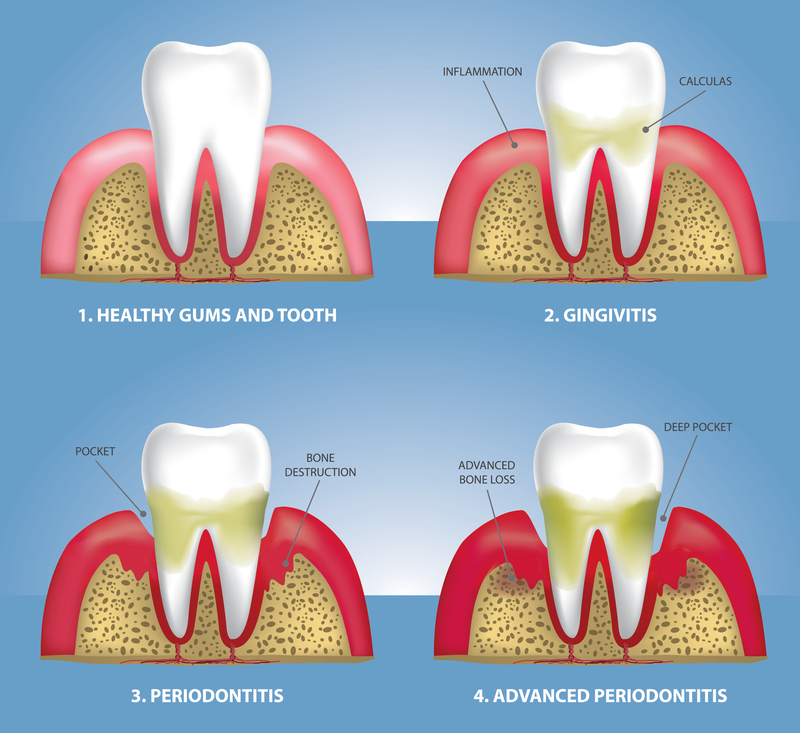 Periodontitis, a more serious form of gum disease, can develop if gingivitis is left untreated. In this case, plaque that is left on the teeth spreads and grows beneath the gum line. Bacteria in the plaque produce toxins that stimulate a chronic inflammatory response. As part of this response, the body reacts by essentially turning on itself, and eventually the tissues that support the teeth break down and are destroyed. What happens is the gums start to separate from the teeth and form pockets around the teeth that can become infected. If the pockets become large over time, the teeth can loosen and have to be pulled. One disorder linked to periodontal disease is diabetes. Research shows people with diabetes are more likely to develop periodontal disease. Gum disease, in turn, can increase blood glucose levels and the risk for diabetes complications. It goes both ways, though. Having gum disease makes it more difficult to control blood glucose. There are other disorders associated with gum disease, including osteoporosis and bone loss in the jaw, which may lead to tooth loss and decreased bone density. Research has found that bacteria that grow in the oral cavity can be inhaled into the lungs and cause respiratory illnesses. An increased risk of various cancers has also been associated with periodontal disease. For example, research found that men were 49 percent more likely to develop kidney cancer, 54 percent more likely to develop pancreatic cancer and 30 percent more likely to develop blood cancers. There was an increased risk for some cancers in women as well. The risk of esophageal cancer increases in both men and women. Numerous studies have been conducted on the link between periodontal disease and cardiovascular disease. Some have shown that the bacteria involved in developing periodontitis can make its way into the bloodstream and cause an elevation of a certain substance in the blood. This substance, C-reactive protein, is a marker for inflammation in the blood vessels. That inflammation increases the risk of heart disease and stroke. There’s more. A recent Chinese study revealed that aggressively treating gum disease may help lower blood pressure in people at high risk for high blood pressure, such as those who have elevated blood pressure levels. This study’s results were reported in November at the American Heart Association’s annual meeting. Another recent study, this one conducted in the United Kingdom, discovered that gum disease could raise the risk of dementia by as much as 70 percent. These findings were presented this past August. The facts are pretty clear. Gum disease can lead to a host of health disorders. This point underscores the importance of keeping your teeth and gums healthy through regular dental checkups and good oral hygiene practices. Your parents were right when they bugged you to brush your teeth when you were a kid. I’m bugging you now. Brush and floss, and follow your dentist’s advice for routine care. It’s not just for your teeth; it’s for total body health!